We’re stuck in a bubble at the moment. Samsung and Apple are at each other’s throats as Google looks on nervously: the future of the smartphone market is due a big change and it’s due one soon. While, for those of you lucky enough to have had a play with one, Samsung’s Galaxy S3 is a real step up from its popular but legally copycat predecessor, it doesn’t really change much in the world of phones, just tweaks what’s already there. Don’t get me wrong, these changes are excellent but you get the impression that some commentators are right; innovation has been stifled in the race for sales. Which is why a piece of under-reported news coming out of a relatively small UK company from Cambridge (we know another small Cambridge manufacturer who recently went big time…) is actually deserving of much bigger headlines. Plastic Logic have developed their first colour, video capable screen. Not that big a deal until you consider that it’s made with plastic electronics – organic manufacturing that leaves it completely flexible and almost indestructible. Now, for those unfamiliar with this idea of plastic (or organic) electronics, it’s based around the use of carbon-based conductive polymers and molecules. This means that a screen can be made that is completely organic and does not need a large power supply at all times, such as with a traditional display. Not only does it have implications on power usage, however – pertinent to these green times as that may be – but it allows for complete flexibility. Modern phones allow a small amount of give in their screens – they should respond to your touch after all – but if you bend them, they’re likely to snap. 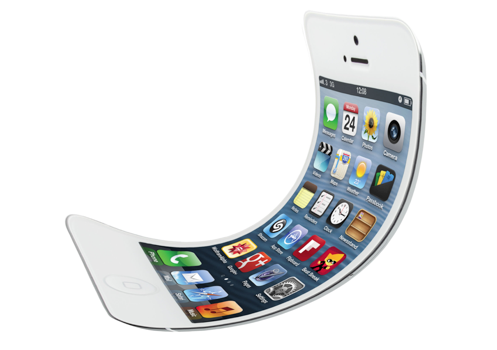 With the phone of the future, made with plastic electronic technology, your device could be folded in on itself, wrapped around a wrist and dropped harmlessly into your briefcase or pocket without worry of damage. This technology has been around for a little while, however, with one main use: e-readers. E-paper has become more popular as it dispenses with the need for a backlight. Not only does this save power but it is far better for your eyes too. Up until now, however, these screens have not been available in colour. Thus, this new technology from Plastic Logic can be greeted with a great deal of triumph, despite its limitations. While the screen is capable of playing video, its refresh rate of 12 fps is too low to really do justice to anything except basic animations, while the resolution is limited to a measly 75 ppi due to the nature of the dual layered colour device. Its potential however is huge. At less than the thickness of a credit card and the flexibility of paper, future devices could be used as newspapers, tablet computers, phones, watches and whatever other electronic tool you need. In 2009, the British government announced that it wanted to champion plastic electronics. While they seem to have forgotten this with a change of government, the Russians are taking full advantage. Plastic Logic’s devices are already in action in Russian schools, allowing children to read, annotate and engage with the future of on-the-go tech. Raxanne Clipper writes about the latest technology, especially about phones, tablets and e-papers. When she is not writing she likes to be together with her friend s and family.